...who created the most beautiful yacht of all. 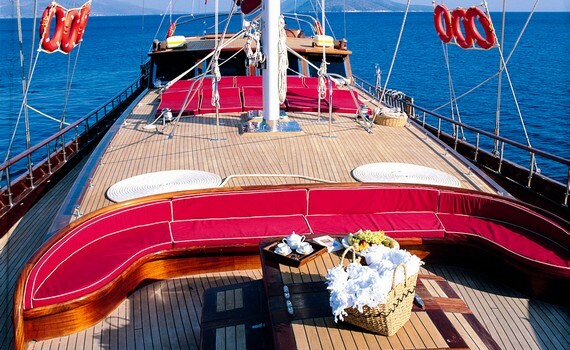 A Yacht Charter Turkey...home of the most beautiful gulets! 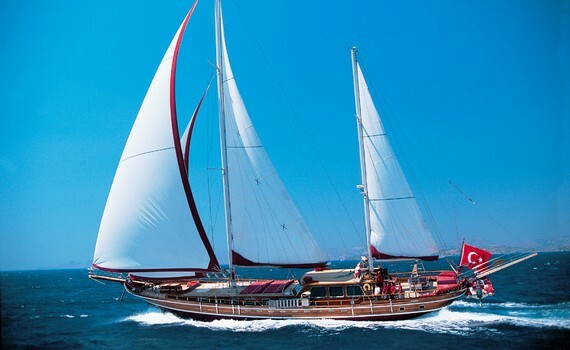 Gulet is a comfortable wooden yacht originating in Turkey, using motor power and sails for navigation. Charter gulets usually accomodate up to 16 guests in 3-8 luxurious cabins, equipped with state-of-the art technical devices. Their high ceilings, wide corridors, comfortable cabins, spacious indoor salon with galley and bar, and plenty of space in outdoor areas all attract cruisers over the world who opt for comfortable, romantic and elegant sailing, with no stress or hurry. Their experienced and very professional crew will take care of your safety and provide you with comfort, trying to fulfill all your yachting wishes. Wonderful, kind chefs prepare tasty meals reflecting local cuisine. The day begins with Mediterranean breakfast - fruit, olives, feta and kasar cheeses, pine honey, sour cherry jam, eggs, tomatoes and bread, with fresh orange juice, coffee or tea. For lunch, you can expect mezes including beans in olive oil, sauteed aubergine in tomato-garlic sauce, green salad and oven baked courgette casserole. Traditional börek will accompany the afternoon tea. The dinner could include grilled calamari, tarator sauce with crushed pine nuts, sauteed purslane and stuffed vine leaves, followed by grilled sea bream with olive oil and lemon sauce or spiced chicken with vegetables. On the gulet, you can try best Turkish wines such as Angora, Cankaya and Saraffin. The national drink in Turkey is raki, a licorice-flavored spirit. A modern, high-performance, grand superyacht, offers new dimension to cruising - a traditional "feel". 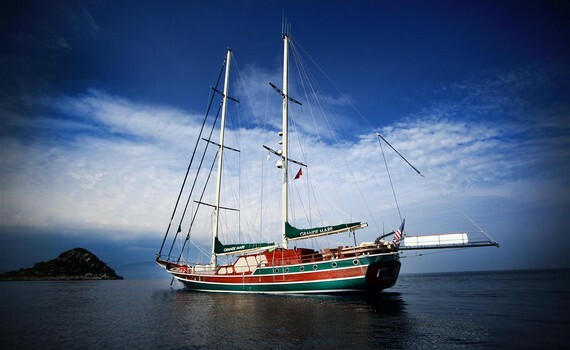 Modern and luxurious gulet offering tailor-made cruises, with the state-of-the art technology. The Chef will prepare all you wish for. 5-cabin modern gulet for exclusive cruising the Mediterranean. Do not miss wonderful turkish specialties aboard. 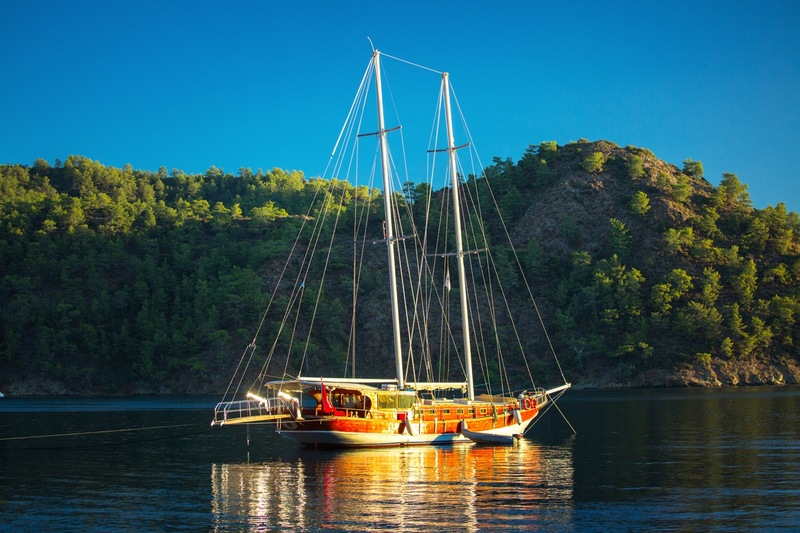 A gulet is an excellent option for a sailing vacation. If you would like to know more about gulets, check out Gulet Cruise Selection, our specialized page on gulet cruises and find out how to charter the perfect gulet, what features to expect, where to go on a gulet cruise, what a typical day aboard a gulet looks like and what you can eat and drink on a gulet cruise. A Yacht Charter Turkey is a proud member of a leading SailingEurope Yacht Charter Group.